When Mike and Kelly bought their house 3 summers ago, the only noteworthy feature in the yard was a low growing weeping red Japanese maple. Except for a few unremarkable shrubs, the yard was pretty much empty except for the grass over uneven ground. Since then, they have applied their vision and talents to transforming it into an Eden-in-progress: they put in a lovely brick path to the back yard, raised beds in the front, a fenced garden in back, and landscaped along the fences with flowers, lilies, lemon balm and even fruits and veggies. This year they are getting their first grapes growing on beautiful vines over the fence. Like all successful gardening couples I’ve known, they wisely divide the labor. Mike does the heavy lifting to manifest Kelly’s vision, and makes sure all the solar lights are working, and Kelly tends the plants and makes decisions about what goes where. Thus, a magical harmony emanates from this well-loved space, and not only that–it yields an abundance of fresh fruits and vegetables for a longer growing season than I’ve known in the last 20 or more years. Kelly is wonderful at going outside and coming back in with the fixings for a whole meal made from the garden, even this early in the year. So when it was my turn to drum something up for dinner, I, too, turned to the magic of the garden for creative suggestions to brighten up some things from the fridge we needed to use up, and I wasn’t disappointed. Some of you may remember my fondness for what I call confetti salad. This meal takes that concept and turns it into a supper or lunch bowl made special by an oil free pesto that gets its eclectic tastiness from what was fresh in the garden. And this time, remarkably, I had the wherewithal to write down what I did right after I did it. If you don’t happen to have these same treasures ready in your own garden and you can’t find them at the grocery store or your local farmer’s market, feel free to improvise. 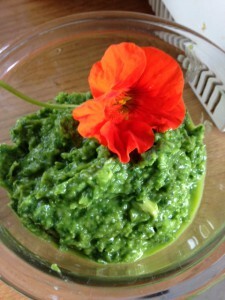 This is an oil free pesto that uses some avocado as a smooth and mellow binding agent. You can pair it with the classics basil and garlic and it should work fine. But if you can, experiment with adding the things I used, or some other herbal garden treasures of your own. 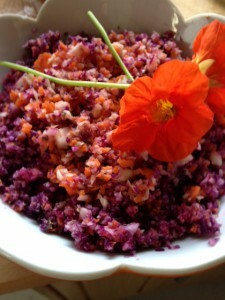 Whir up the roughly sliced carrots, cabbage, garlic and lemon juice until it’s the consistency of confetti. Put some brown rice in a bowl. Top with a scoop of confetti vegetables. Top that with a dollop of Eclectic Garden Pesto. Sprinkle with chickpeas. Decorate with a nasturtium flower if you have one. (Optional topping: pumpkin seeds, raw, or tossed with tamari, Braggs, or coconut aminos and lightly roasted.) Be creative. Mix it all up and enjoy. 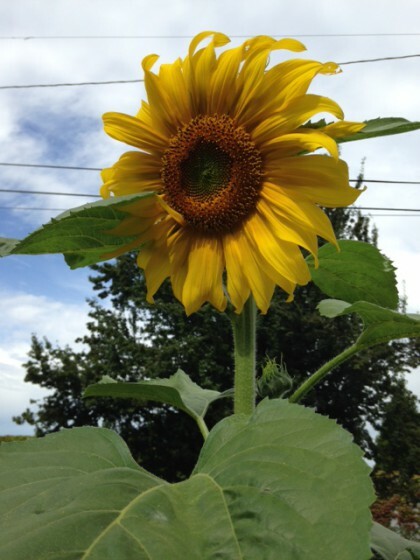 This incredible sunflower in Kelly and Mike’s front garden opened just in time for the exact Solstice point Sunday morning. Now that’s some potent garden magic. Happy Summer, Friends! Hi Maria! We seem to cross paths! I live in Boise, but spend time in Moscow where my 2 sons have gone to U of I. One son is leaving soon for grad school at UCLA. But, I will be in Portland 3 times this summer! And I love it there! I was just there to visit my nephew and his fiance who live there. It is such a great town and I now that you will do well there. I wish you the best! Vita Cafe and Verde Cocina are 2 awesome restaurants with menus that accomodate for special diets. I just saw your reply! I’ll have free time during the day on Monday July 27th. We’re staying downtown Portland, but I think I can figure out transportation. Maybe meet for coffee/tea somewhere? That would be fun! 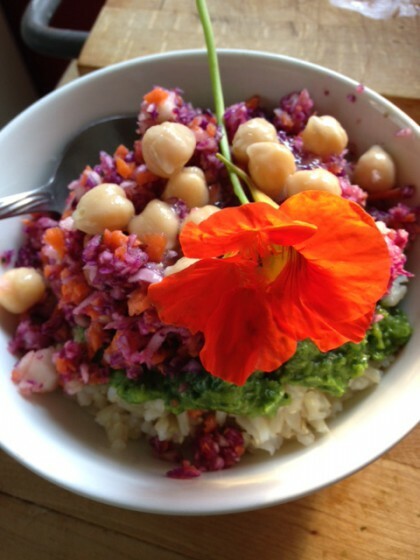 Your confetti bowl with pesto looks like a fantastic summer lunch! I will definitely make that with the bounty from the farmer’s market. Our yard is in the “nothing is growing yet” phase – we are prepping it for a total overhaul. Soon there will be raised beds for various veggies, avocado and citrus trees, kiwi vines, the whole edible shebang! I’m excited to be able to do what Kelly does – get dinner just by walking outside.